Lest by the great you will be despised like me. 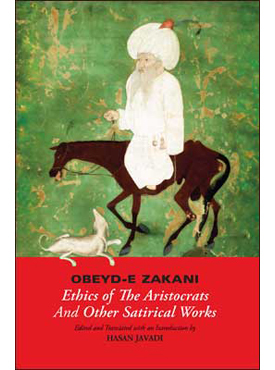 Obeyd-e Zakani, who died in 1372 is among the great poets of Iran but little known in the West. This selection of his work is the first to be translated into English. Obeyd was a remarkable satirist and social critic who looked upon his world of extravagant indulgence and corruption with the censorious eyes of a Juvenal, and portrayed it with the cynicism and wit of a Voltaire, and the hilarious grotesqueness of a Rabelais. He used scathing stories and sardonic maxims to paint a world full of deceit, greed, lust, sycophancy, and perversion, where old values and virtues were scorned and extremes of wealth and poverty, violence and bloodshed were the order of the day.